FIVE THINGS FRIDAY: Better. | Frankly, My Dear . . . This week I received a wonderful comment on a Five Things Friday post from last summer. It was about poetry, but when I reread the post today, I remembered it was also about the Writer’s Club I belong to. Having someone recognize a post I wrote so long ago makes me feel better about writing and blogging and, honestly, just sharing life in general. 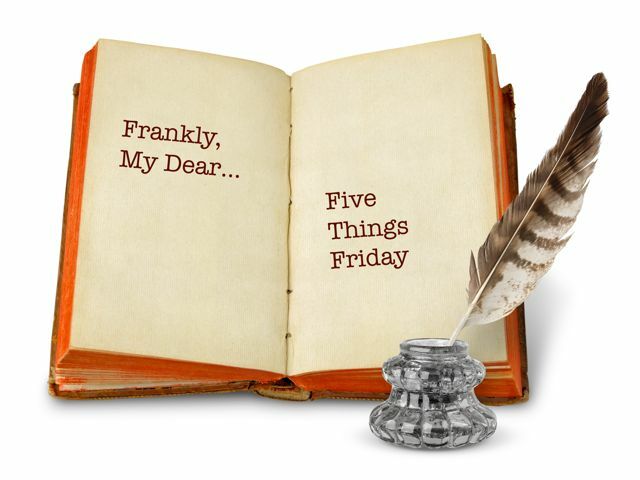 Taryn’s comment also inspired me to reinstate the Five Things Friday blog posts. And what theme could be better to re-kick it into gear than, well, better? My favorite word of this year, and probably for life. 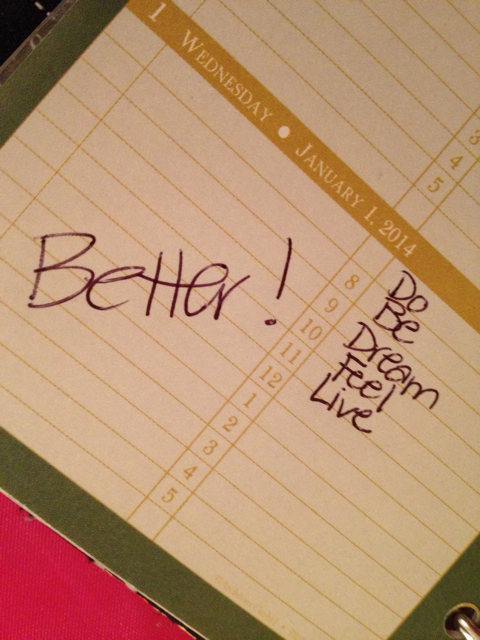 Let’s get this started ~ here are my Five Things Friday: Better. 1. Writing. Y’all saw my new desk last week, right? How could my writing not be better when I have such a great place to write? The plan must be working. Megan and I have locked up the first three chapters of Book 1 of The Grenalia Chronicles. We can’t wait for you to read about Amara, Saven, Fisal, Delving, Yez, Berin, Amrais and Linwe. Yes, we made up those names. Invented a few creatures. And are in the midst of creating a magical fantasy filled with swords and sorcery and dragons and . . . well, you’ll just have to stay tuned. We’re also keeping a notebook of things we write that won’t be in the final draft. Someday, that notebook will be a best seller in itself. We have quite the sense of humor when we’re tired. 2. All roads lead to NOLA. I’m also working hard on my novel set in New Orleans. My characters are coming to life bigger than ever. I tasted my first beignet two weeks ago, and it was everything I thought it would be. Of course, it’s not from Cafe du Monde, but it was acceptable. I have a goal to finish NOLA by the end of this year, sell it big, and celebrate at next year’s Mardi Gras. That would pretty much make This Girl oh-so-happy. And y’all know Harry Connick, Jr. hails from NOLA, right? Yes, indeedy. Seeing him on American Idol every week ~ twice a week, at that ~ is just another way to keep me inspired. 3. Budget. It took a lot to get here, to the point where I’m secure in my finances. Let me rephrase that: my budget stinks. But I refuse to stress over it. Yes, I still have trouble making ends meet. Yes, I’ll be in trouble if a big emergency happens. But I’m not unique. I’m not special. Everyone is hitting hard times. The best I can do is the best I can do. 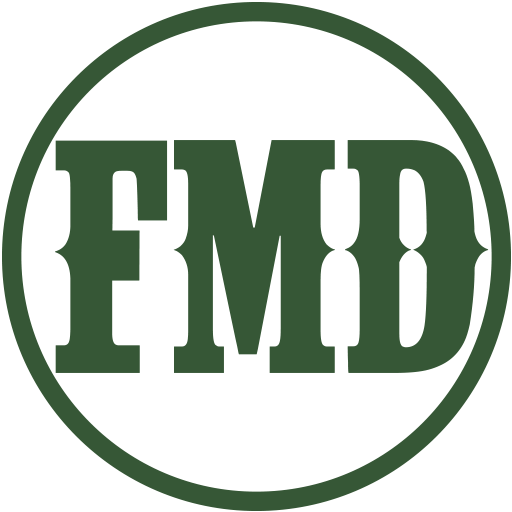 It’s okay to tell the creditors that I can’t pay in full this month. It’s okay to pay just $5 more than the minimum payment. It’s okay to wait until just before the due date. And it’s okay to not feel bad for not doing more. All I can do is all I can do. And as long as I’m really trying, I’m seeing those glimpses of success. And someday soon, one bill will be paid off. And then another. And then another. And it may take another few months, or another year or two before I can take another trip to Disneyland or eat a beignet at Cafe du Monde. However long it takes, I’m okay with that. 4. My Housing Project. I’m still working on my dirt lot of a yard. I’ve decided to put little effort into changing it, and more effort into cleaning up and maintaining it. Next year I can plant and plot. This year will be the pre-work work. This summer I’ll pull up old stumps, weed, rake, and do whatever else it takes on the outside. 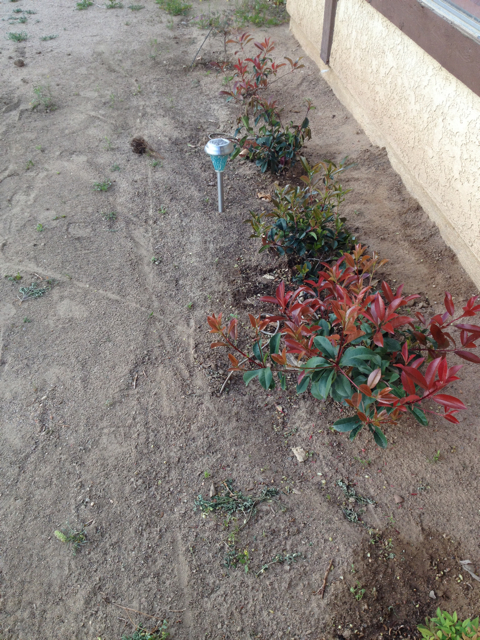 The only planting for this year has already been done. 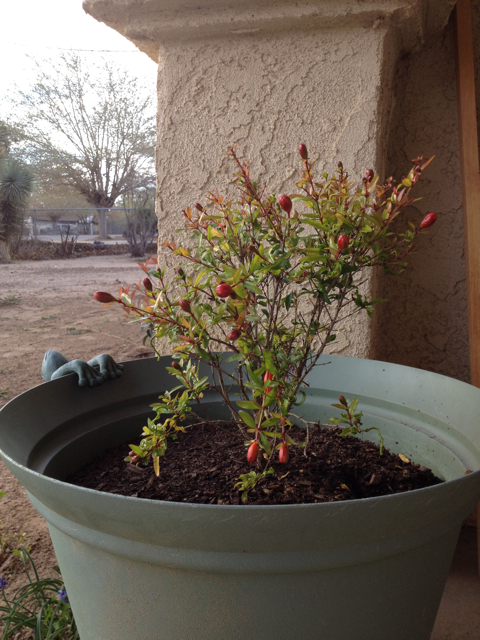 I bought two more Photinia for under the Big Window, and a dwarf Pomegranate tree. On the inside, we’re doing things better, too. 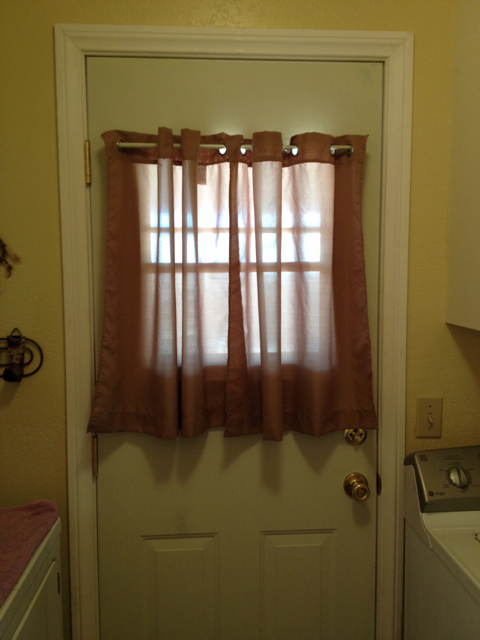 I hung curtains in the laundry room. I love it. It’s a nice soft look for the house, blocks the bright summer sun, and keeps the neighbors from glimpsing over the fence line. (Thankfully, I have decent neighbors who don’t have voyeuristic tendencies.) It’s the finishing touch to the laundry room. 5. Appreciation. It’s a little thing, but what a difference it makes! I’m trying to put forth better effort into appreciating the people already in my life, the things around me, and the experiences I’ve had. I’m more aware that my perceptions of the world outside myself isn’t necessarily the reality. I don’t know the inner struggles of someone else unless they choose to tell me. I can’t understand the physics or engineering of putting a building together. But I’m thankful for the shelter. I want to be patient with what goes into making my life mine, and I want to better express my thanks to all that is already a part of it. If I do all that I can do, I hope it’s enough. Sometimes it’s hard to put into words. Sometimes all I can say is “thank you”. But I’m definitely paying attention. And I definitely have a new appreciation for everything, and everyone. And those are my betters for Five Things Friday. What are yours? Leave your comments or link up your own blog posts in the comments below. We’ll get this done, White Gurl! Let’s do this! Love you. 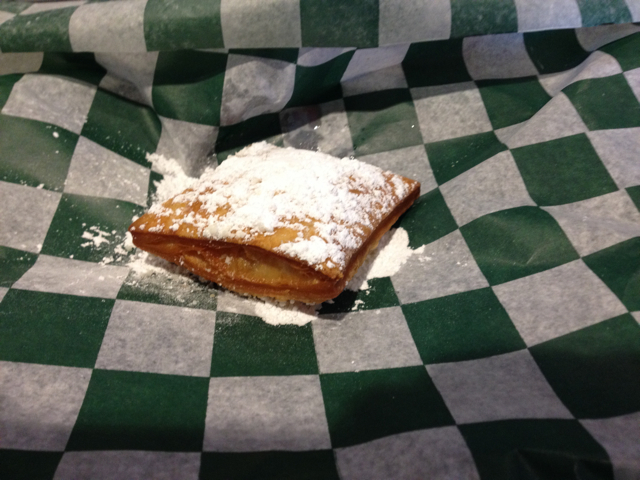 I’ve never heard of a beignet before… I had to look it up. It does seem delicious! It’s the powdered sugar that makes it so wonderful. Molly Jo recently posted..FIVE THINGS FRIDAY: Better.